David Haye has admitted punching fellow British boxer Dereck Chisora while holding a glass bottle during their brawl in Munich on 19 February. The former heavyweight world champion was involved in the violent confrontation after Chisora's defeat by Ukrainian Vitali Klitschko. 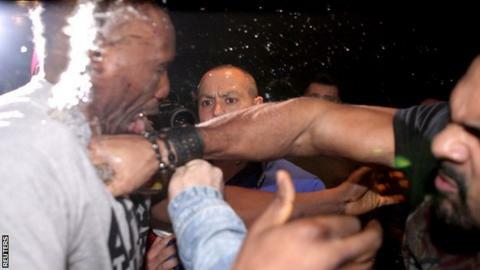 Haye, 31, also reiterated that he remains retired from the sport and does not want a fight with Chisora. "I didn't hit him with that bottle, I hit him with my fist," he explained. Speaking on ITV's That Sunday Night Show, Haye added: "It was a glass bottle but, if I'd had my mobile phone in my hand, it would have been a mobile phone. "If I'd had a hot dog in my hand, it would have been [that]. "It wasn't a beer either, it was a bottle of lemonade." Haye has been absent from boxing since losing his WBC heavyweight world championship belt to Wladimir Klitschko in Hamburg last July. And he said he was not interested in facing Chisora. "I've got no desire to fight Chisora inside the ring or outside the ring," Haye explained. "He's lost his last three fights [last three of four]." Haye defended his behaviour a week ago in Germany, but did concede that his actions may have damaged the image of British boxing. "I had no other option [than to fight]. I could have stood there with my hands by my side and got punched, kicked or spat at," he added. "Why wouldn't I defend myself? If I could rewind time, of course I wouldn't go down [to the press conference]. But you can't rewind time."